SNAP Cats rescued Lucky from San Francisco, CA. Lucky is a little spitfire of a cat. For what she lacks in size she makes for in attitude! Lucky came to us recovering from alopecia (fur loss), which we think was due to a flea allergy. Her coat is still very short (except for her face and around her neck), but it is growing back slowly. 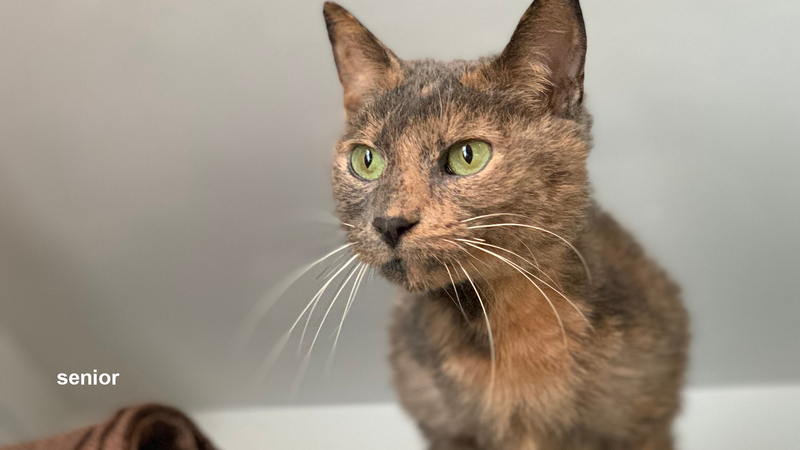 Lucky tolerates other cats, as long as they keep their distance (about two feet away), so she’d be okay in a with another cat or two, but would probably love being an only kitty. Lucky’s favorite time of the day is at night – she sleeps on top of you, right on top. And it’s a bit comical because when you go to roll over or move, Lucky gives a low growls to let you know she doesn’t like moving. But it’s not aggressive at all. Just a complaint! If you have room in your heart and your home for a petite spitfire of a cat, please let us know. Thanks!